Directions Do not use more often than directed. As soon as possible after exposure, cleanse affected area with soap and water. Gently pat dry. Apply Ivarest liberally to form a layer you can not see through. Adults and children 2 years and older: apply to affected area not more than 3 to 4 times daily. Children under 2 years of age: consult a doctor. Avoid contact with clothing. Ivarest may stain certain fabrics. 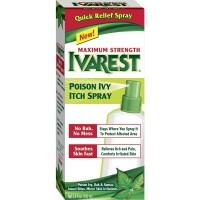 Uses For the temporary relief of pain and itching associated with poison ivy, poison oak, poison sumac, insect bites or minor skin irritations. Dries the oozing and weeping of poison: ivy, oak, sumac. Ivarest contains the most effective active ingredients to relieve itching and discomfort for up to 8 hours, while helping to dry the rash. 1. Antihistamine helps stop the reaction. 2. Analgesic soothes itch fast. Plus skin protectant to help dry the rash. Warnings For external use only. Do not use: on large areas of the body; with any other product containing diphenhydramine, even one taken by mouth. Ask a doctor before use: on chicken pox, on measles. When using this product: do not get into eyes. Stop use and ask a doctor if: condition worsens; symptoms lasts for more than 7 days or clear up and occur again within a few days. Keep out of reach of children. If swallowed, get medical help or contact a Poison Control Center right away.